4.9 x 3.8 x 2.7 in. With a 12-megapixel sensor, a high-res 3-inch LCD, and a six frame per second burst rate, the Pentax K-r takes up the middle spot between the K-7 and the K-x. The Pentax K-r sports a number of improvements over the K-x, most notable of which is the addition of autofocus indicators in the viewfinder, something missing from both the previous K-2000 / K-m and the followup K-x. Like the K-x, the Pentax K-r comes in three body colors in the US market: black, red, and white. Pentax says that for the K-x, the non-traditional colors have been very popular, and they're expecting the same for the K-r. But the Pentax K-r doesn't seem to be just about fun and fashion. There's more to this model, including a 921,000-dot, 3-inch LCD, ISO sensitivity ranging from 100 to 25,600, in-camera HDR and Night Scene HDR mode, and 720p HD video recording at 25 fps. A unique touch on the Pentax K-r is a dual-power system that lets users choose their preferred battery type. By default, the K-r ships with a proprietary lithium-ion battery that provides the maximum energy density, but courtesy of an optional battery holder, it can also accept four standard AA batteries -- great when you've nowhere to charge your batteries, or if your other gadgets accepts AAs and you don't want to carry multiple charger types on a trip. Also unique is an infrared data transfer method compatible with the IrSimple / IrSS data transmission systems, allowing wireless image transfer at high speed either from camera to camera, or to certain devices such as cell phones, printers or computers. Couple the K-r with a compatible smartphone, and you can upload images to the web or send them by email near-instantly after capture, without the need for cables, computers, or third-party hardware. The Pentax K-r includes a sensor-shift Shake Reduction system to compensate for camera movement during exposure. The system also serves as a dust-reduction system, shaking the sensor to remove dust that might have attached to the sensor. Autofocus is done via the SAFOX IX sensor, which features 11 autofocus points, nine of them cross-type sensors. A spotbeam projector throws out an AF-assist beam to help with autofocus on nearby objects in low ambient light, and as we already mentioned, the Pentax K-r's optical viewfinder includes illuminated AF points. The Pentax K-r uses SD or SDHC memory cards for storage, and a firmware update provided shortly after the camera shipped enables compatibility with SDXC cards as well. Available since October 2010, the Pentax K-r comes body-only and in several kits. Body only pricing is set at US$799.95. Kit prices are US$849.95 with only an 18-55mm lens, US$899.95 for the 18-55mm and 50-200mm kit, or US$999.95 for a kit including the 18-55mm and 55-300mm optics. Something of a cross between 2009's flagship K-7 and entry-level K-x models, the Pentax K-r has the basic body elements of the K-x, but mimics the styling and incorporates some of the more advanced features of the K-7. Based around a slightly tweaked version of the sensor that debuted in the K-x, the K-r has identical sensor resolution and pixel density, and yields similar image quality -- great news, because the K-x's 12.4-megapixel sensor beat the 14.6-megapixel sensor in the K-7 hands down, although the company's current flagship K-5 has since made a significant step forward in image quality, and now rules the roost. Even if it doesn't quite match up to the K-5's sensor in terms of resolution and noise performance, though, the K-r provides Pentax fans with a more affordable alternative to the company's flagship model, while still retaining very good image quality, and a number of important benefits over the K-x, key among these being the autofocus indicators in the optical viewfinder. Walkaround. The Pentax K-r is physically a little larger than the K-x and a little smaller than the K-7. Its weight with lithium-ion battery and Secure Digital card loaded--but with no lens mounted--is 21.1 ounces (598g), a little heavier than the K-x, but still a fair way below that of the K-7 and K-5. If you prefer to use AA batteries, the K-r falls closer to the middle ground. AA battery weight will obviously vary depending on the type selected, but by way of comparison, a set of Sanyo's Eneloop batteries weigh somewhere in the region of 3.8 ounces (108g), plus about another 0.6 ounces (16g) for the battery holder. Combined, that's well over double the weight of Pentax's proprietary pack. While the body of the Pentax K-r is sculpted to appear more like the K-7, it has no LCD on the top deck, thanks to the presence of the Mode dial on its right side. A nice indent on the grip helps the middle finger find its place quickly, and there are rubber panels on both the right and left side of the body, as well as slight lip at the front edge of the K-r's left side which provides some extra purchase for your fingers while chimping. Two modern strap lugs bookend the top panel, and are recessed to prevent them catching on anything. We find these far preferable to the neckstrap D-rings used on the company's flagship K-5 model, as they avoid the metal-on-metal interface that results in unwanted noise during video capture. From the front you can see the infrared receiver / self timer lamp in the hand grip, and the spotbeam projector autofocus-assist beam borrowed from the K-5 / K-7 design. This brightly illuminates in green as the camera feels it to be needed, and although you can disable it altogether, you can't force the camera to use it for any given shot. Since the K-r's body is quite a bit smaller than the flagship models, the lamp is of necessity even closer to the lens mount, and hence more likely to be blocked by larger lenses, especially if a lens hood is mounted. Of course, you're not likely to need a lens hood in conditions where AF assist is needed, but if your hood stores reversed on the lens, you'll likely want to remove it. The only front-panel control is the lens release button, positioned just below and to the left of the lens mount in the picture above. The top view shows only a few elements, and other than styling differences, is basically identical to that of the K-x. Two speaker holes are on the left of the pentaprism housing. The diopter correction slider appears just behind the hot shoe, accessible through a cutout in the top of the rubber eyepiece. Unlike the K-7 and K-5, there is no Front e-dial in front of the shutter release button; only one e-dial on the rear of the body is used to make adjustments to aperture or shutter speed, as well as menu selections. In Manual exposure mode, this e-dial changes the shutter speed, and you have to press and hold the Av button on the top deck to adjust aperture. This button also serves to access Exposure Compensation. Just right of the EV button is the Green button, which re-centers exposure and metering settings depending on the mode. Rather than the sloping shoulders of the K-x, we find an even flatter plateau than that of the K-5 / K-7 design. Control layout, though, is all K-x, with all the same positions. The Flash Up/ Delete button is positioned at upper left of the LCD. The e-dial to the right of the viewfinder eyepiece is well positioned for easy thumb operation. Below that are the Playback, Live View, Info, and Menu buttons. A card access lamp window is just to the right of the Live View button, and below that is a very small four-way navigator with an OK button in the center. I have large hands, and found this a little close to the edge of the camera to be very comfortable, but it's a necessary compromise to achieve the K-r's relatively compact size. Those with smaller hands likely won't have any issue. The upper right corner has the AF-activation and AE-Lock button. You can see the outline of the SD card door, which is opened with a pull to the rear, then it swings out toward the right. The left-side view of the Pentax K-r shows the 18-55mm kit lens and the no-nonsense profile. Behind the lens mount is the Focus mode switch, and on the left-hand end of the body, there's a new IrSimple / IrSS infrared port for high-speed wireless data transfer, just above a small rubber flap that conceals the combined USB / standard definition video output port. Sensor. The Pentax K-r is based around a 12.4-megapixel, APS-C sized (23.6 x 15.8mm), RGB CMOS image sensor, with a total resolution of 12.9 megapixels. While the resolution and size are identical to that of the chip used in the previous K-x model, it's actually a newly designed chip. Shake Reduction. As in the K-x, the sensor assembly is mounted on a moving platter, used to provide for both in-body shake reduction and dust removal. The shake reduction system in the Pentax K-r provides the same claimed 4-stop improvement as that of the K-x, and as with that camera, doesn't include the rotational correction ability of the system used in the company's flagship K-7 and K-5 models. The sensor-shift mechanism is also used as part of Pentax's dust removal system, shaking the sensor assembly to remove dust particles from the low-pass filter that's overlaid on the CMOS sensor. (Unlike the K-7, the Pentax K-r doesn't include a piezoelectric element, which can vibrate the low-pass filter at a higher frequency than is possible with the sensor shift mechanism). Although we don't have an objective way to measure dust removal efficacy, we've subjectively found systems that rely on shaking the sensor assembly are generally somewhat less effective than those based around piezoelectric systems. Processor. Output from the Pentax K-r's new image sensor is processed by the same PRIME II (PENTAX Real Image Engine II) imaging engine as in the K-x, but the combination offers worthwhile improvements over that camera in terms of both sensitivity and burst shooting. The K-x was no slouch when it came to high ISO shooting, but its expanded maximum sensitivity limit of ISO 12,800 has been moved into the Pentax K-r's standard range, with the new body offering an extremely wide standard range of ISO 200 to 12,800 equivalents. The Pentax K-r's sensitivity range can be expanded to encompass ISO 100 to 25,600 equivalents. Burst speed. The Pentax K-r's burst performance is even more impressive, beating not only the K-x, but also Pentax's previous flagship K-7 model in terms of outright speed. Where the K-x was capable of shooting at 4.3-4.6 frames per second, and the K-7 was limited to 5.2 frames per second, our in-house testing found the Pentax K-r's Continuous Hi drive mode to be capable of a full 5.6-5.7 frames per second -- a speed that the company notes makes it the fastest of any entry-level digital SLR, and not far behind the 6.4-6.5 frames per second of the current flagship K-5 model. At 30 full-resolution JPEG, 13 Raw, or 10 Raw+JPEG frames using our hard-to-compress test target, burst depth is also handily improved from the K-x's 25 JPEG, 5 Raw, or 4 Raw+JPEG frames. In JPEG mode it almost matches the 31-frame burst capability of the K-5, although for Raw shooters the flagship model offers much better depths of 23 Raw or 22 Raw+JPEG frames. For subjects where a little less speed is required, the K-r's Continuous Lo mode captures JPEG images at a sedate two frames per second for as long as there's available card space, and is rated by Pentax as capable of 36 Raw frames in a burst. Autofocus. Pentax has also upgraded the K-r's autofocus system to its latest SAFOX IX system, a designation which had only previously been applied to the company's medium format 645D model. Compared to the previous-generation SAFOX VIII system used in the K-x and K-r, SAFOX IX has the same point count and arrangement, but several important differences. There are a total of eleven points, of which all but two are cross-type, sensitive to both horizontal and vertical detail. The cross-type points are arranged in a three by three grid towards the center of the image frame, while on either side of this grid there's one linear sensor. The SAFOX IX AF module's optics have improved transparency, which Pentax claims translates to improved performance in low light. The AF module's optics also have better controlled aberration, said to further improve autofocus accuracy. Ambient temperature, says Pentax, also has less of an impact on the SAFOX IX module. Sharp-eyed readers will note that the K-r's SAFOX module lacks the "+" designation of the modules featured in the 645D, K-5, and K-7, and this hints at one omission in the Pentax K-r's AF system. Where the flagship APS-C and medium format cameras all include a secondary light color sensor dedicated to determining the light source type, which is then taken into account when determining focus, the Pentax K-r lacks this function. Beyond the AF module itself, the Pentax K-r includes a couple of other significant features that are present in the flagship K-5 and K-7 models, but not in the K-x -- and one of these answers one of our main criticisms with its entry-level sibling. The Pentax K-r adds a dedicated autofocus assist lamp, where the K-x depended on either an external flash strobe, or rapid, low-power strobing of its internal flash to provide assist illumination. Perhaps more importantly, though, the Pentax K-r now includes an indication of the active autofocus point(s) in its optical viewfinder -- a feature that was conspicuously absent in both the K-x, and the preceding K2000 (aka K-m). This should not only make manual AF point selection more natural, negating the need to remove your eye from the viewfinder while making point selections, but also makes it easier to confirm that the correct subject has been selected for focusing when using automatic point selection. The pentamirror viewfinder is otherwise unchanged from that of the K-x, with the Pentax K-r providing the same 96% viewfinder coverage, 0.85x magnification, and -2.5 to +1.5 diopter adjustment. 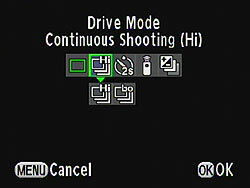 One final autofocus-related change is to be found in the Pentax K-r's Live View mode. The contrast detection algorithms used while Live View is active have been overhauled, and in concert with the newly developed image sensor, offer significant improvements in both accuracy and speed over those of the K-x. LCD. The Pentax K-r's restyled body is just slightly taller and a touch wider than that of the previous K-x, and likely part of the reason for this is down to a change in the camera's LCD display. Where the K-x offered up a 2.7-inch panel with modest 230,000 dot resolution, the Pentax K-r now has the same 3.0-inch LCD diagonal as the flagship K-5 and K-7 models. It also shares the same 921,000 dot resolution, which roughly corresponds to a 640 x 480 pixel array, with each pixel comprising separate red, green, and blue dots. Although it's not articulated like those of some competing DSLRs, the K-r's LCD has a wide 170-degree viewing angle in both horizontal and vertical axes, which helps somewhat when shooting over a crowd, from the hip, or low to the ground, as well as when chimping your images with friends. Connectivity. Like the entry-level K-x, the Pentax K-r lacks an HDMI high-definition video output, instead providing only a standard-definition NTSC / PAL composite video output. Note that Pentax doesn't include the necessary cable in the product bundle, so if you want to connect your camera to a TV, you'll need to purchase the cable yourself. Of course, it also includes a USB 2.0 High-speed connection, providing for data transfer to a computer. It does add one connectivity option that's a first for a Pentax DSLR -- and in fact, we believe it's a first for any DSLR model. The Pentax K-r includes IrSimple / IrSS support -- the latest generation IrDA standard for wireless data transfer using an infrared transceiver. IrSimple and IrSS are both based on the Fast IrDA physical layer, but with tweaks made to reduce latency, resulting in the Infrared Data Association claiming 4-11x throughput improvements over its previous IrDA-4M protocol. The difference between the two protocols is that IrSimple is bi-directional, while IrSS is a one-way protocol which doesn't provide for the receiving camera to acknowledge data reception or request retransmission. Although I don't have access to any IrSimple devices for in-house testing, I understand that in the real world, IrSimple transfers should manage around one megabyte every two seconds -- rather too slow for transferring large quantities of data, but perfectly acceptable for sending downsampled copies of images to another K-r body, as well as compatible devices such as cell phones and printers -- and if you've the appropriate hardware in your computer and aren't in a rush, it could potentially save you connecting cables or moving flash cards to transfer a few images between camera and computer. The K-r allows transfer of downsampled images at 0.3 or 2.0 megapixel resolution, as well as full-resolution images, but movies can't be transferred via infrared. An interesting possibility raised by the K-r's unusual IR transfer function is the ability to send images to your cellphone and then immediately upload them to social network sites, or share them via email. This will doubtless prove popular with the younger generation, who thrive on such immediacy, and while it's possible to achieve the same thing with some other DSLRs using cables or wifi-capable flash cards, the K-r is unique in being able to provide the capability without any third-party hardware, so long as your cell phone is compatible with IrSimple. Perhaps slightly more unusual is an IrSimple "matching game," in which characteristics of images can be compared between cameras, and unspecified algorithms used to rate which image the cameras consider to be the "best" -- sort of a modern equivalent of Top Trumps, for those familiar with the once popular card game from the 70's and 80's. Each camera keeps a score count of wins, losses, and draws, which can be reset if you find yourself embarrassed by a particularly low score. There's basically no information on what criterion merit a winning result on any metric though, and they certainly don't appear to relate to image quality in any way. Although I didn't have access to two camera bodies so as to perform challenges, the K-r also lets you see the score for all three criterion while you're selecting the image with which to present (or answer) a challenge, and I noted that for example, an image that was radically underexposed outscored a better-exposed image on all three gauges. Dual power. Another significant difference between the Pentax K-r and its siblings is found in its power source. The K-x continued Pentax's tradition of offering entry-level DSLRs with support for standard AA batteries -- something that makes the company unique in the current DSLR marketplace. The flagship K-5 and K-7, by contrast, accept only a proprietary lithium-ion battery pack in the camera body, although they can accept AA batteries in their optional portrait grip accessory. For the K-r, Pentax offers the best of both worlds: compatibility with both a proprietary lithium-ion pack, and with AA batteries, in-body. The lithium ion cell is provided in the camera bundle, and four AA batteries can be inserted using an optionally available D-BH109 battery adapter. When using the proprietary cell, the Pentax K-r is just 2% heavier than the K-x, despite a 5% increase in body-only weight thanks to the larger LCD panel and increased body size. For AA shooters, the battery adapter does add a little extra weight (with the combination weighing around 7% more than the K-x), but considering that this is due in part to the increased body size, it's not a difference you're likely to notice in the real world. Battery life when using the new D-LI109 lithium-ion battery pack is rated at around 470 images to CIPA testing standards (with 50% flash usage), and playback time is rated at 300 minutes. When using rechargeable 1,900 mAh NiMH AA batteries, battery life falls to 400 shots with 50% flash usage, but playback time increases slightly to 330 minutes. The best battery life is achieved with lithium disposables, at some 1,000 images with 50% flash usage, or 620 minutes of playback, but obviously you have to factor in the cost (and environmental impact) of replacing the lithium batteries after the equivalent of just two charges of the proprietary cell. Finally, the ubiquitous AA alkaline disposables are usable in a snip if you can't find anything else, yielding around 120 shots with 50% flash usage, or 270 minutes of playback. Storage. Like all the company's cameras launched since 2009, the Pentax K-r not only supports Secure Digital and SDHC memory cards out of the box, but will also support the latest generation SDXC cards courtesy of an available firmware update. Although their speed is unchanged, SDXC cards are already available in significantly higher capacities than their other SD brethren. Note, though, that as with all of Pentax's current SDXC-compatible cameras, the K-r provides no support for the higher-speed UHS-I cards, which will revert to standard speed operation. Custom image modes. The majority of other differences between the Pentax K-r and its predecessor are to be found in its firmware functionality. Pentax has added an additional custom image mode to the existing eight found in previous models, emulating the look of Bleach Bypass images. Even if you've not previously heard the term, it's likely you're familiar with the effect, as bleach bypass has been a popular effect in the movie industry for many years. With film, the effect was achieved by skipping or abbreviating the bleaching stage of processing, leaving some silver in the emulsion alongside the color dyes. The effect is a grainy, high-contrast look with reduced saturation and exposure latitude. Filters. There are also two new filter functions not found in the earlier K-x and K-7, whose effects are self-explanatory. The sketch filter mimics the look of a hand-drawn image, while the posterization filter causes abrupt transitions in tone. The color extraction filter has also been updated, and now allows two color ranges to be highlighted in an image, with colors outside these ranges desaturated. The Pentax K-r also includes an updated version of the cross-process function that debuted in the K-x. In that camera, the function -- accessed through its own option in the record menu, rather than as a filter or custom image mode -- could only be switched on and off, and yielded a random effect that couldn't be previewed ahead of time. In the Pentax K-r, it's still possible to use the cross process function in this manner, but there are also three preset cross process modes that offer a consistent look from shot to shot. In addition, there's an adjustable user favorite preset, which allows the look to be tailored to the photographer's needs. HDR. The Pentax K-r also updates the high dynamic range function that debuted in its prosumer K-7 model, and was retained for the K-x. The function allows capture of images with greater dynamic range than the sensor is capable of detecting, by taking multiple images with varied exposure, and then combining them in-camera to produce a single shot with increased dynamic range -- and since it involves multiple exposures, it's only useful for relatively static subjects. At the time of the K-7's launch, the feature was unique in the digital SLR market, but it's since been mirrored -- and improved upon -- by rivals. White and red are the two alternate colors. Only white comes with a lens with matching accents; red has an all-black lens. 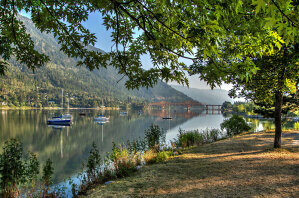 The Pentax K-r's updated HDR mode includes several changes. The most significant of these is that the K-r now microaligns images before combining them, making it possible to shoot handheld HDRs. (Previously, even a slight camera movement would cause artifacts throughout the image, rendering it unusable -- and hence HDR mode was limited to tripod use.) There's also a new Night Scene HDR mode, and further control over the strength of the HDR effect applied. Movie mode. The Pentax K-r also has two changes to its Movie mode, compared to earlier Pentax DSLRs. Like the K-x, the K-r can record either standard definition VGA (640 x 480) or high definition 720p (1,280 x 720) movie clips using Motion JPEG compression, in an AVI container. Note, though, that it lacks the Full HD (1,920 x 1,080) mode found in the K-5. Where the K-x had a capture rate of 24 frames per second, the K-r now records movies at a rate of 25 frames per second. It also now allows use of a subset of Pentax's various filter functions when recording movies, as well as one additional filter that's specific to movie capture. Unlike some competing cameras, none of these filters causes any adverse effect on movie framerate or playback speed. Colors. The Pentax K-r is available in the US market in three body colors -- black, white, and Pentax red. Compared to the red version of the K-x, this latter is less orange, and closer to a fire-engine red. The white-bodied version of the K-r is available with a matching white version of its 18-55mm kit lens, while all other kit lenses (both for the white K-r, and the other body colors) are provided only in the standard black color. Pricing for the Pentax K-r is set at US$800, with availability since October 2010. In addition, three kit bundles are available, all of which will include a selection of Pentax's DA-L lenses. For US$850, the Pentax K-r comes bundled with an 18-55mm lens. For $900, the K-r is available with both the 18-55mm lens, and a 50-200mm model. Finally, for photographers looking for the most zoom reach, a US $1,000 bundle includes the 18-55mm lens, and a 55-300mm lens. As I mentioned in our recent review of Pentax's flagship K-5 digital SLR, I'm very familiar with the company's cameras, having first purchased the previous K-7 model in late 2009, and recently upgraded to the Pentax K-5. Given that it features a very similar on-screen UI, as well as a number of controls and operating modes unique to Pentax, I felt quite at home with the K-r from day one. It's certainly a much friendlier camera for consumers, thanks to common features like Scene modes and a flash strobe that can deploy automatically, but compared to the preceding K-x model (which remains available at an entry-level price), the K-r feels like a more serious photographic tool. It even manages to best the company's previous-generation flagship in a number of important areas, although it does lack the rugged, weather-sealed design and some of the more advanced features of the K-7 and K-5 models. If you're willing to make that tradeoff, though, the K-r also offers a significantly more attractive price tag, as well as a worthwhile savings in both weight and size. Although the body design features plastic panels over a steel chassis, it feels sturdy and creak-free. Note that my gallery photos captured on a walk around downtown Knoxville, Tennessee to accompany this shooter's report were taken using the smc PENTAX DA 17-70mm F4 AL (IF) SDM lens, as I didn't have access to the smc PENTAX-DA L 18-55mm F3.5-5.6 AL lens which comes in all K-r with-lens kits. The 17-70mm lens, which we've reviewed on our sister site SLRgear.com, offers a pretty good performance optically, although with some noticeable chromatic aberration towards the ends of the zoom range. We've not reviewed the 18-55mm DA L kit lens, but I understand it to be closely related to the DA version of the same lens, which we felt to be a fairly good performer when its pricing is considered. The DA L version includes some cost-saving features such as a plastic lens mount, and the removal of the quick shift focusing feature, but should perform similarly otherwise. It's certainly not in the same class as the significantly more expensive 17-70mm though, and so I'd caution readers not to expect quite the same levels of detail from the standard kit zoom. Handling. Shooting with the Pentax K-r, I found its body very comfortable for the most part, although the grip is a little angular for my liking. The slight lip along the left hand end of the front panel is a very nice touch, making for a much more reassuring two-handed hold while chimping, browsing menus, or shooting in live view mode, despite the short protrusion beyond the lens mount. My only real complaint with body design was that I found the four-way controller pad a little to close to the bottom right corner of the camera body, making it somewhat uncomfortable to reach without changing my grip. That's in part because I have very large hands, and it's also a necessary compromise in keeping the K-r's body size down. It also took me a little while to get used to the differing placement of the Green button, and I'd like to see Pentax standardize this -- the rear-panel location of the K-5 and K-7 feels more intuitive. My time with the K-r also reminded me of why I prefer cameras with separate front and rear e-dials, rather than the single-dial design typical of most consumer DSLRs, particularly in playback mode and menus, where Pentax's flagship cameras cleverly let you switch between images while retaining playback zoom, and jump directly between menu tab groups. Otherwise, I was very happy with the control layout on the Pentax K-r, though -- it's approachable, easy to use, and packs in enough controls that you need spent relatively little time in the menu system. High ISO. During my time as a K-7 owner, I often considered picking up the Pentax K-x as a second body, solely because of its impressive high ISO sensitivity / noise performance, an area in which the company's then-flagship camera surprisingly lagged behind its entry-level sibling. Given that the K-r retains that sensor design with only relatively minor tweaks, its not surprising that I found its image quality similarly pleasing. Of course, the world has moved on in the last couple of years, and Pentax's new flagship K-5 offers even more impressive high ISO / noise performance than either the K-x or K-r, so the rightful order of things has been restored. If you're shooting with older Pentax cameras such as the K2000 / K-m, K20D, or earlier, the current generation of Pentax DSLRs all offer you the ability to use natural light for a greater proportion of your shots, something I've come to appreciate very much in shooting with my K-5. Viewfinder. You may have noticed that I said I considered buying a K-x. I never actually did so, and the reason for that was its lack of any viewfinder indication of autofocus point selection, either when allowing the camera to select the point automatically, or when doing so manually. With automatic selection, the only way to tell for sure which AF point(s) had achieved a lock was to look at the image on your computer, using software capable of identifying the AF point info from the EXIF headers. 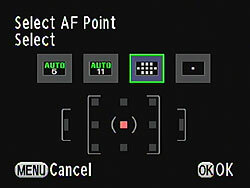 For manual mode, selecting the AF point meant removing your eye from the viewfinder, so you could make your selection on the rear panel LCD, making it hard to quickly select the correct point for spontaneous shots. It's something for which we came down quite hard on the K-x, and so I was thrilled to discover that Pentax had rectified this on the K-r. Active AF points briefly illuminate with a little red square (or for the left- and rightmost points, a vertical rectangle), just like they do in Pentax's flagship cameras. The ability to select the AF point without taking my eye from the viewfinder made it much easier to manually select a focus point while framing a moving subject, such as my hyperactive two year old, where previously I'd have basically been forced to rely on auto point selection for spontaneous shots. After the launch of the K-r, I heard from several Pentaxians who favored AAs, and who felt the battery holder design to be a step backwards. To me, though, the change is an upgrade for AA shooters too. The holder is very light: barely half the weight of a single Sanyo Eneloop battery cell, and if weight was the most important issue, you probably wouldn't likely be shooting with AAs in the first place. What it lets you do, though, is replace the batteries en masse. Instead of having to fumble to figure out what's the right way around, flip them about, drop a couple, pick them back up, then slot in four batteries one at a time, you can simply pre-load the battery holders. Buy two or three holders, pop the spares in your camera bag ready-loaded, and hey presto, you get the convenience of a single proprietary pack, while retaining anything else for which you favor AAs. High-speed shooting. When I reviewed the earlier K-x model, I said that one of my favorite features was its burst shooting speed. The K-r kicks things up a notch, and is now not only one of the fastest cameras in its class, but also bests Pentax's previous flagship model, as well. In fact, it's not that terribly far off the speed of the company's current flagship. Fast burst shooting tends to be thought of as a pro or prosumer feature, but I think for spontaneous shots of kids and pets, many consumers could likely improve their results simply by rattling off a quick burst, and then immediately deleting all but the one or two frames they're happy with. It certainly helps me, anyway! I'm getting a little older, and my reflexes aren't what they used to be. The Pentax K-r's swift burst shooting helps when I'm chasing around after my hyperactive son, who simply won't stay still for longer than two seconds unless he's asleep. The burst depth is very generous by consumer SLR standards, although for Raw shooters it lags some way behind Pentax's flagship K-5, yielding plenty of frames in each burst, and boosting my chances of a successful shot. As a Raw shooter, I did find myself having to wait around a while for bursts to finish writing to the flash card, though. It's a shame that none of Pentax's current-generation SLRs support the higher-speed UHS-I cards that are starting to ship, and I hope they do so in future models. Shutter sound. One thing I definitely do prefer about my Pentax K-5 is its relatively muted shutter / mirror noise. It's an unusually quite camera in operation, especially considering its burst speed. By contrast, the K-r is quite a bit louder, and its shutter noise is more of a sharp metallic click than the soft thump of the K-5. For single shots, the K-r's shutter is by no means terrible, but when capturing somewhere around six frames per second, it can make a bit of a racket. For many uses this isn't an issue, but if you're somewhere that you need to keep noise to a minimum--a wedding, say--you might find yourself on the receiving end of some stern looks if you rattle off a 30-frame JPEG burst or two. Infrared transfer. Much as I'd have loved to do so, I didn't get to try out the Pentax K-r's IrSimple / IrSS infrared transfer capability, since I don't own any other IrSimple products. I can be a bit of a Luddite when it comes to social networking, but even I can see the attraction of instantly being able to share photos with friends and family, straight out of the camera. Of course, the same thing can be achieved by using Eye-Fi's recently announced Direct Mode, and wifi-capable devices are rather faster and more ubiquitous than IrSimple ones, but it's nonetheless pretty cool that the K-r supports cable-free data transfer right out of the box, so long as you've got a compatible cell phone, printer, or other gadget. The curious Dueling game, though, I think was perhaps not the best investment of Pentax's resources. Unless you know somebody else with a K-r, it's of no use whatsoever, and even if you do then it doesn't seem to have much lasting entertainment value after the initial novelty wears off. Nor does there seem to be any rhyme or reason to what constitutes a winning photo. It certainly doesn't seem to relate to how good the photo looks in any manner, as I found a severely underexposed shot to outscore a properly exposed one on every single one of the (undescribed) criterion. I'd much rather have seen Pentax invest its time and money in providing an in-camera help system suited to the K-r's target market, or perhaps the tethering functionality whose absence I've bemoaned ever since the debut of the K-7. (Although there is at least now a third-party solution available, albeit unauthorized). Overall. All in all, though, I found the Pentax K-r to be a very fun camera to shoot with, and a much more well-rounded design than the company's earlier Pentax K-x model. From a K-5 owner's perspective, even if it doesn't quite match the flagship camera's high ISO image quality, it would nonetheless make a capable backup body at a much more affordable price than purchasing a second K-5. For owners of Pentax's earlier cameras, it's almost a no-brainer, either as a second body with much-improved image quality to complement one of the weather-sealed flagship models, or as an across-the-board step up from one of Pentax's earlier consumer cameras. Most digital SLRs will produce a reasonable ISO 100 shot, so we like to push them and see what they can do at ISO 1,600, at their default noise reduction settings. Recent advances in sensor technology have made ISO 1,600 look a lot more like ISO 100, but there are still cameras whose quality starts to fall apart at this setting. I also choose 1,600 because I like to be able to shoot at or above this level when indoors and at night. We also explore ISO 3,200, and look at the high-contrast detail of ISO 100 vs 3,200 and 6,400. We'd expect to see a little more difference between the two images, given the new sensor, but there is still some difference evident. The back wall, for example, is more neutral gray than yellow, and contrast in the Mas Portel label and the mosaic image seems better. More of the red leaf swatch data seems to be obscured in the K-r shot as well, suggesting more aggressive noise suppression in the red channel. The Canon T3i resolves more detail, to be sure, given its 18-megapixel sensor, but the K-r's 12.4-megapixel sensor performs admirably nonetheless. Both have trouble with the red leaf swatch, and I prefer Pentax's rendering in this case. What the K-r doesn't get right is the pink swatch beneath, which it renders rather more purple. The Pentax K-r shows less chroma noise in the shadows and does a little better with detail in the mosaic bottle than the Nikon D5100, despite the Nikon's 16.2-megapixel sensor. But the D5100's red leaf swatch looks better, closer to the actual fabric, so Nikon's approach produces more balanced results. Again despite the higher resolution, the Pentax K-r does well against the Panasonic G3. We prefer the rendering of the background in the K-r's image, and though it resolves less detail overall, the quality of that detail is quite good, especially in the Mosaic image. The G3 does slightly better in the red leaf swatch. The pink swatch is oddly lower contrast in the G3's image. 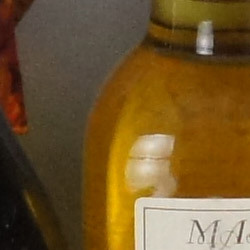 Sony's more aggressive approach to noise suppression blurs the background behind the bottle, and their tendency to oversharpen is also noticeable in the top bottle shot. Noise suppression again makes more blur in the mosaic crop. 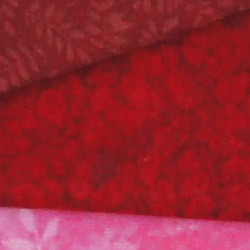 There's more contrast in the red leaf swatch in Sony's image, but it's still a bit of a mess compared to the original. Nearly identical again, I see a grayer background, more contrast and distinct tiles in the mosaic label, but also a more purple rendering to the pink swatch. The red leaf swatch is a blur in both. Noise suppression in the Canon T3i now starts to erase some of the detail that the K-r leaves intact. It also blurs the letters in the Mas Portel label and makes and artificial mess of the red leaf swatch. But the background behind the top bottle is smoother than the K-r's rendering, and the pink swatch is very purple. Chroma noise creeps up in the Nikon D5100's image, also appearing in the mosaic label, and while the K-r's image has darker gray blotches, it's still clean in terms of color noise. The D5100 also starts to lose detail in the mosaic, where the K-r retains it, but again, Nikon produces a better approximation of the red leaf swatch, while the K-r gives up. Panasonic's G3 employs very aggressive noise suppression at ISO 3,200, softening the background and sharpening high-contrast areas. Detail is also lost in the mosaic label, as was true of the Nikon and Canon offerings. The red leaf swatch appears worse than the K-r.
Again, the K-r does a little better than its higher-resolution competition in the A560. 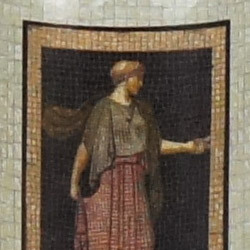 The background appears blurry, high-contrast areas seem oversharpened, and the mosaic image shows lost detail between the tiles. But the red swatch is still closer to reality in the A560 image. Detail comparison. High-contrast details are often sharper as ISO rises, so they're worth a look as well. Like its predecessor, the K-r suffers from color moiré as it renders the lines between the letters on the Pure Brewed label. Because the label has turned somewhat, it's hard to tell if they've improved it or if the angle of the label has just changed. You can see hints of color errors in the Sony A560's image as well, but not in the Canon, Nikon, or Panasonic shots. The K-r also loses the red in the text, but id toes hold on to black and white detail fairly well, still finding the lines in most of the letters. ISO 100 to 400 images look great at 20x30 inches; ISO 3,200 shots print well at 13x19, and even ISO 25,600 shots make a good 4x6-inch print. ISO 100 to 200 shots look great at 20x30 inches, with excellent detail and color. ISO 400 images look good at 20x30, but some luminance noise creeps into the shadows. It becomes a non-issue when print size is reduced to 16x20 inches. ISO 800 shots also look good at 16x20 inches, with some luminance noise, and minor loss of detail in low-contrast red areas. ISO 1,600 images also look good at 16x20 inches, though there is some softening in detail overall, and the red leaf swatch continues to degrade. Reduction to 13x19 inches brings detail back to what can be called crisp. ISO 3,200 images print well at 13x19, though luminance noise is a bit noisier. Detail remains pretty sharp, though, except for the red areas, which lose more detail than other areas. ISO 6,400 images have good detail at 11x14 inches, but luminance noise is a bit rough in shadow areas, which warrants reduction to 8x10, where it's not bad at all. ISO 12,800 shots again have good detail, but noisy shadows at 8x10. Reduction to 5x7 brings it back to an acceptable level. ISO 25,600 shots look soft and untidy at 5x7, but look much better reduced to 4x6, though some of the colors lack detail thanks to a saturation boost. Overall an excellent performance from the Pentax K-r.
See below for our conclusion; be sure to check the other tabs for detail test results. Large capacity SDHC memory card. These days, 8GB Class 4 is a good tradeoff between cost and capacity, but if you plan to capture many movie clips, look for larger cards with Class 6 or faster ratings. When I reviewed the Pentax K-x last year, I was left with rather mixed feelings. It clearly offered a lot of camera for the money, but unfortunately retained one of the biggest shortcomings of its predecessor -- the lack of any autofocus point indication in the optical viewfinder. Thankfully, the Pentax K-r corrects that oversight, while retaining much of what made its predecessor great. While it's not quite as small and light as the K-x, the Pentax K-r is still a very compact camera by DSLR standards, and its high ISO / low-light performance frees the K-r shooter to rely solely on available light in a wide range of shooting conditions. The Pentax K-r is also top of its class in terms of burst shooting speed, and offers numerous worthwhile upgrades over its predecessor. Key among these is a larger and significantly higher resolution LCD panel that makes both image review and live view a much more useful proposition. The picture's not entirely rosy, however. Body-only pricing for the K-r is fully one quarter higher than that of the K-x, and there are some areas where the Pentax lags behind the competition. Low-light autofocus and battery life both stand out as areas where I'd like to see improvement, and like that of the flagship K-5, the K-r's movie mode feels decidedly dated in comparison to even entry-level rivals. As I said in our review of the K-5, however, I'm still not entirely sold on the utility of DSLR video capture for consumers, although it can be impressive in the hands of a pro, so I'm not inclined to judge harshly in this area. Overall, the Pentax K-r provides a pretty good value proposition, even at a higher price tag than its predecessor. Especially for those with an investment in the company's glass, the K-r offers a very worthwhile upgrade over earlier Pentax models at a price that still won't break the bank. If you can afford to pay the extra for the K-5, it's clear that there's even more to recommend in the company's flagship mode, but those on a budget will doubtless still be very pleased with the Pentax K-r, and for photographers who want in-body AA battery compatibility it's clearly the best available option. Despite some slight reservations over the increased pricing of the company's 2011 DSLR lineup, we're happy to select the Pentax K-r as a Dave's Pick.